They are short on details, but I see a couple major issues with their analysis if we actually want to try to use this to answer the question of how well the so-called “wealth gap” explains persistent B-W gaps. all of this will tend to mask the racial differences and the relative predictive power of parent education. Also individuals with coefficients on the low to negative side (lower predicted SAT scores) are much more likely to be black (south, HS drop out sibling, low asian HS, no college-bound friends, etc). If they truly believe that wealth per se has such a large effect on school quality and they believe that school “quality” actually has such profound effects, then adding these other variables in and reducing the resolution of other popular correlates is a terrible choice. People sort into neighborhoods and pick peer groups on the basis of race, class, and more and just because neighborhood lets you make some strong predictions about the individual does not mean that those neighborhoods or, especially, the schools in them actually cause those differences. Suffice it to say, I do not find their analysis compelling. There is no statistically significant difference in B-W bachelor degree attainment rates if we merely control for IQ. Blacks are, if anything, more likely to attend college below ~115 IQ; above it the CI is huge (not enough blacks with IQs that high to even ball park estimate differences in this cohort). 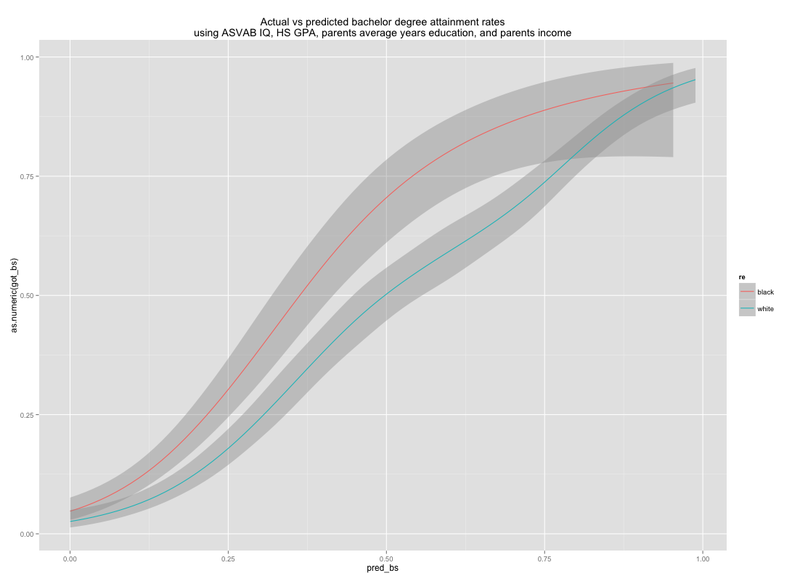 We can predict bachelor degree attainment rates quite well using just IQ and HS GPA (r=0.58). There is no statistically significant white-advantage here either. Parental net-worth (as observed in 1997) is not especially well correlated with IQ (r=0.24 for whites) or SAT scores (r=0.19 for whites). The wealthiest blacks still fail to outperform most whites of modest means and, as in some of my prior analysis, there is no evidence that having the means to escape these neighborhoods actually results in non-linear gains for blacks. Parents’ income and parents’ average years education (modeled as continuous variable), for instance, are quite a bit stronger. Even without controlling for IQ or HS GPA, where we know there are significant gaps, there really are not large gaps in bachelor degree attainment rates. Wealths adds little in the way of incremental predictive validity. I setup a general linear model using race/ethnicity, parents’ average years education, and parents’ 1997 income level with interactions with race/ethnicity for both income and education to predict child IQ (ASVAB scores). I get a fairly strong correlation (r=0.57). In short, there is precious little evidence that wealth adds much independently these predictions once we implement rudimentary SES controls (income + education) or that it could possibly explain the B-W gaps. Moreover, it’s not a safe assumption that wealth per se causes those potentially small gains (if real). It’s likely that those studies that purport large wealth effects are confounded by poor controls for SES and by race/ethnicity differences in savings and consumption behavior. Below is a summary with coefficients. To ease comparison across multiple measures, I scaled all of these variables into standard deviation units with a mean of zero…. Although it is true that the race/ethnicity differences are not statistically significant (not enough power w/ all of these other variables), the actual coefficients are quite large (it’s worth bearing in mind that these B-W differences are consistent with many other studies). A 1 SD increase in wealth, about $137K, corresponds to about a 0.06 SD increase in IQ… that’s pretty trivial in my book. Put differently, if I do not control for race/ethnicity in the model and just use education+income+wealth, the fit is much weaker and there are still large systematic differences between groups. It’s also worth repeating that just because there is a small correlation with wealth here that that does not necessarily mean wealth itself causes it. The parents average years education is just a proxy for parent education levels and single-year income measures are subject to some volatility. It’s likely that if we controlled directly for both parents’ test scores (IQ, SAT, ACT, etc) directly that both income and wealth would vanish to something pretty close to zero. The size of the “controlled” B-W wealth gap (i.e., controlling for income and education) is often overstated. Wealth is fairly well correlated with the parents’ average years education and parents ‘income levels. There is a B-W wealth gap, but it is not terribly large. It is about 50K (less than 0.5 SD in the NLSY97 data) for most of the middle class plus part of the distribution and quite a bit less below that. Also asians have higher net worth than predicted and hispanics have higher net worth than blacks. This tends to support the notion that there are behavioral differences driving these differences (e.g., marriage/divorce rates, labor force participation rates (consistency), savings vs consumption choices, etc) and that current wealth differences probably has relatively little to do with the past (e.g. redlining, the GI bill, etc). The data argues against the notion that “school quality” differences are driving these differences. In the same elementary, middle, and high schools there are large systematic differences between racial/ethnic groups. If the historical wealth explanations were meaningfully true, if “twice as good” has any practical meaning, we should presumably expect to find the opposite, i.e., blacks at (roughly) the same level of “wealth” presumably ought to be better educated, have higher incomes, be harder working, etc, which should presumably suggest that their kids should do better in the same schools. We find very much the opposite: they do much worse on average across the board and relatively worse in schools with higher average performance (larger in-school gaps). There is also the analysis conducted by Roland Fryer and Stephen Levitt, that finds large and growing B-W gaps between Kindergarten and 3rd grade with an extensive set of controls in place (e.g., SES, school, classroom, birthweight, etc etc). A number of stylized facts emerge in this paper. We find that Blacks continue to lose ground relative to Whites in second and third grade at a pace consistent with the losses observed between kindergarten and first grade. On average, blacks are losing .10 standard deviations per year relative to whites in the first four years of school. In contrast to Fryer and Levitt (2004), however, systematic differences in school quality appear much less important in explaining the differences in test-score trajectories by race once the data are extended through third grade; Blacks lose substantial ground relative to whites within the same school and even in the same classrooms. That is, including school or teacher fixed effects do little to explain the divergent trajectories of black and white students between kindergarten and third grade. Hispanics continue to make up their inferior initial conditions relative to whites, while Asians continue to make gains. Explanations other than school quality that we have explored also fail to convincingly account for the growing gap between Blacks and students of other races. By the end of third grade, even after controlling for observables, the black-white test score gap is evident in every skill tested in reading and math except for the most basic tasks such as counting and letter recognition which virtually all students have mastered. The largest racial gaps in third grade are in the skills most crucial to future academic and labor market success: multiplication and division in math, and inference, extrapolation, and evaluation in reading. Any initial optimism is drowned out by the growing gap. Wealth is unlikely to even explain differences in educational attainment. Controlling for IQ (ASVAB) and parents education levels, we find that blacks are significantly more likely to attain bachelor degrees. The B-W differences in IQ and educational attainment cannot be plausibly explained by wealth, school quality, or the like. It is true that IQ and educational attainment correlate with wealth to varying degrees, but wealth is also correlated with parental education and parental income levels. It clearly doesn’t add much after we have already controlled for income and education levels and the differences between whites and blacks also aren’t all that large after we have done that. Some analyses may find that the predictive power of individual race and parental educational attainment shrinks once you account for neighborhood characteristics (“concentrated poverty”), however people sort into neighborhoods for a variety of reasons (cognitive, ambition, cultural norms, etc) and wealth doesn’t appear to be driving B-W differences along these lines. Evidence from Moving to Opportunity (MTO) or similar experimental designs suggests that neighborhoods have little to no causative effect on cognitive measures or academic outcomes. Thank you so much for answering my question! I’ve been meaning to post a long response for a while now, but I figured I wasn’t going to get around it. So let me just ask you two quick questions. Since these are not necessarily related, they might be best addressed in separate posts. They are both broadly related to race and IQ though. 1. Richard Lynn argued in IQ and the Wealth of Nations that a big reason why African countries are less developed is that blacks have a lower IQ. You’ve stated that you think genetics account for a half a standard deviation gap. That means we could get to 100 for white IQ and 93 for black IQ (and increasing over time). Could such a small difference really account for the differences between Europe and Africa? 2. When you look at maps of average IQ by country (such as https://upload.wikimedia.org/wikipedia/en/9/92/AverageIQ-Map-World.png), they tend to reflect how members of that ethnic group perform in the United States. There are a few exceptions, including people of Austronesian, South Asian, Middle Eastern, and North African descent. Is this just a product of immigration selection? If so, how can you know that Americans of East Asian descent are doing well because of IQ and not selection? And how exactly does a single race end up with different subgroups that have such different IQs? For example, Europeans, Middle Easterners, North Africans, and South Asians are all Caucasians, but there seems to be a very big gap. East Asians and Southeast Asians are the same race, but there is an even larger gap there. If you think this is genetic, could you brief me on the science of how this happens? You also seem to think that intelligence is largely genetic, and that there is little that can be done to change it. Myerson et al. 1998 used the same data that was used for The Bell Curve to show that among blacks who graduated from college, intelligence increased by more than half a standard deviation from matriculation to graduation. What do you think about this? See: Race and General Cognitive Ability, The Myth of Diminishing Returns to Education. Thank you so much for providing your insight on theses issues! I couldn’t help but notice the focus on “degree attainment’. While a useful measure, I don’t think this addresses the fact that not all bachelor degrees are created equal. School selectivity and field of study, amongst others, determine the floor of IQ necessary for certain degrees. For example, you see very little black/latino representation in STEM fields. Put simply, I think your theory would be even stronger if you took into accoun tthis affect.